Despite limited riots along the border on March 30 and the firing of five rockets into Israel from Gaza, the Kerem Shalom and Erez border crossings were reopened and the Gaza fishing zone also expanded. 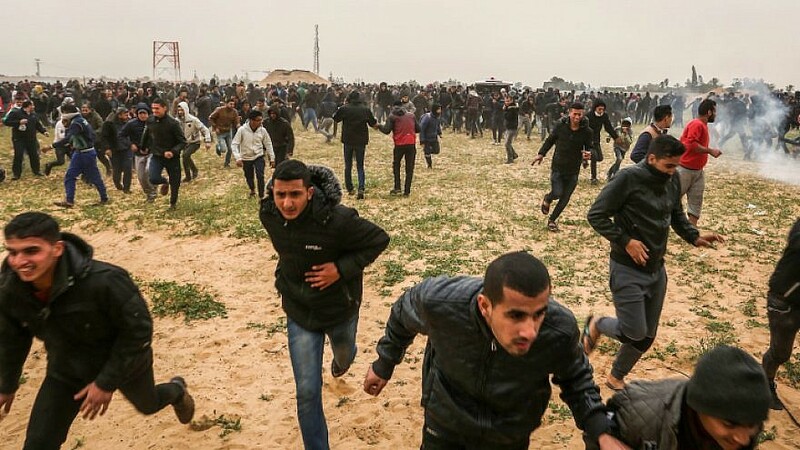 Palestinian protesters take part in the "Great March of Return" demonstration, near Israel-Gaza border, east of Rafah in the southern Gaza Strip, on March 30, 2019. Photo by Abed Rahim Khatib/ Flash90. (March 31, 2019 / JNS) Despite limited riots along the Israel-Gaza border on Saturday and the firing of five rockets into Israel from Gaza, the Kerem Shalom and Erez border crossings, which were closed on Monday after a long-range missile from Gaza nearly killed an Israeli family in their home, were reopened on Sunday. The Gaza fishing zone was also expanded. Hamas ordered schools closed to promote attendance at riots at five points along the border with Israel last week, with approximately 40,000 people showing up on March 30 to mark both “Land Day” and the one-year anniversary of the “March of Return,” a Hamas-organized weekly riot targeting IDF soldiers. While most of the demonstrators stayed away from the immediate border vicinity, and the Israel Defense Forces said the riots were more subdued than in previous weeks, some rioters threw explosives at IDF troops and attempted to attack soldiers. Israeli forces relied on tear gas, but utilized live fire in some instances, killing four terrorists. An additional 64 people were wounded. Two young children estimated at 8 years old were caught by IDF forces while trying to cross the border with a knife. Soldiers stopped the boys, gave them water, and then returned them to Gaza through an official border crossing. Following the firing of five missiles from Gaza, Israeli tanks fired on multiple Hamas observation posts in Gaza. No casualties were reported on either side. The skirmish occurred as Egypt made efforts to broker a ceasefire agreement between Hamas and Israel which Hamas deputy political chief Saleh al-Arouri said was expected in a matter of days. Included in the deal is expected an economic incentive package from Israel. It also occurred just days after a popular uprising against Hamas leadership and deteriorating living conditions in Gaza was quashed by Hamas officials.